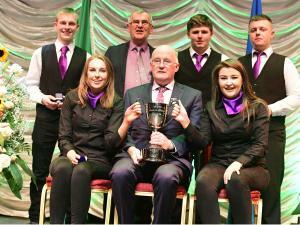 A never to be forgotton occasion for Kilshannig on claiming a first time All Ireland Scór Sinsir title in a brilliantly staged decider at the Royal Theatre, Castlebar. Victory tasted sweetly for the Kilshannig Ceol Uirlise in the 50thstaging as they put together a selection of foot tapping jigs and reels to sway the outcome and collect the silverware from GAA President John Horan. Elsewhere Muireann Vaughan(Kanturk) and St. James Bailéad Ghrúpa went close as did the Millstreet Quiz team. Amhránaíocht Aonair: Michael Burke, Ballinderreen- Galway. Aithriseoireacht: Michael Mc Gibney, Cornafean-Cavan. Boird Tráth na gCeist-(1)Churchill-Kerry, (2)Cornafean-Cavan, (3)Monaleen-Kerry. Mc Gibney, Cornafean, Co. Cavan. Bailéad Ghrúpa: Ferbane, Co. Offaly. Ceol Uirlise: Kilshannig, Co. Cork. Rince Seit: Aghamore, Co. Mayo.el Mc Gibney, Cornafean, Co. Cavan.